Mr Morgan said: "For work you get a bit of experience and training in first aid, but this was by far the worst road traffic collision that I have seen in this country. "It was harrowing. I've seen some dark things during my time, but you never expect to see something like this in the UK. "That's what was so shocking - that it came from nowhere, and that it was so close to home." Four people were killed and a woman and two children are in a serious condition in hospital after a lorry smashed through the central reservation on the M5 on Saturday afternoon. The lorry collided with oncoming traffic heading southbound towards Bristol after it careered across the northbound carriageway between junctions 16 and 14 in south Gloucestershire on Saturday. All three lanes of the motorway's southbound carriage are now open, while the northbound carriageway is expected to remain closed until Monday morning. “On approaching the vehicle I could already hear two children screaming and when looking inside they were both in the back suspended upside down from their seat belts. By this time others had arrived at the scene to try to help those caught up in the fatal accident. Alex said: “We took them up the bank and along the bank away from the vehicle so they could receive first aid from paramedics who arrived extremely quickly on scene. “At this point myself and a handful of others were attempting to get a response from the woman who was in the front of the vehicle. “I could see just from looking through that the adult male was sadly already dead due to the damage to his side of the vehicle, however another man checked his pulse from the rear of the cab and I attempted to feel one myself from the front, to no avail. Alex continued: “Sadly there was nothing anyone could do for the man and the car was covered soon after to prevent distress from onlookers. 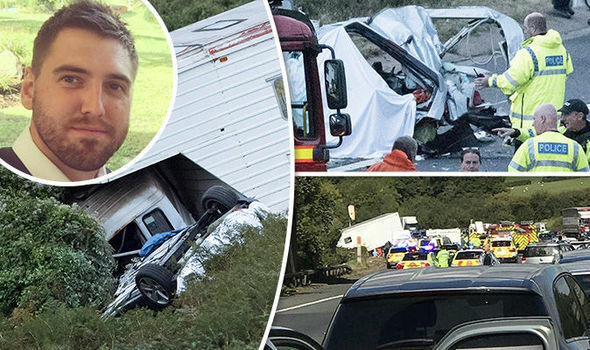 “On returning up the bank a small handful of us began looking in the area in front of the lorry to help identify others who may have been in the third vehicle that was struck, presumably heading northbound as well. Mr Morgan praised the reactions of the emergency services and the public and wished those caught up in the accident a speedy recovery. Superintendent Simon Ellis said: "Emergency service personnel have been working tirelessly at the scene in harrowing conditions and I'd like to praise them for the work they've done and are still doing. "I'd also like to thank the members of the public who courageously went to the aid of those involved in this collision and in some cases rescued them from their vehicles. "Our priority is to ensure the victims' next of kin are notified and supported, as well as the ongoing management of the scene, and this important work is ongoing." He added: "We know this has been extremely disruptive to many people but we've had to prioritise the rescue and recovery operation and ensure we carry out a thorough investigation at the scene.